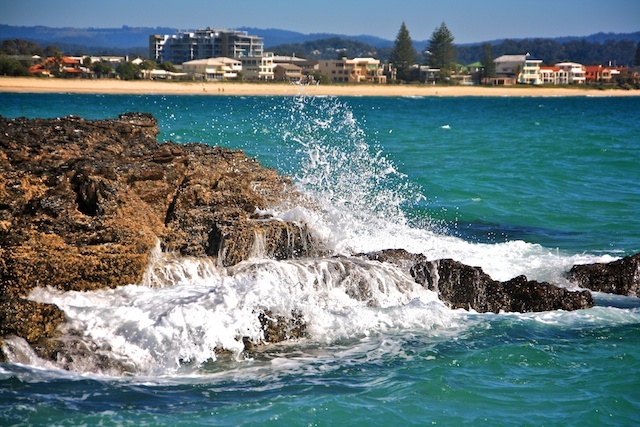 A few weeks ago, in what is usually the cold winter month of August we went to Currumbin Beach on the Gold Coast with our camera club. It was a beautiful warm day. This is what we love about living here. 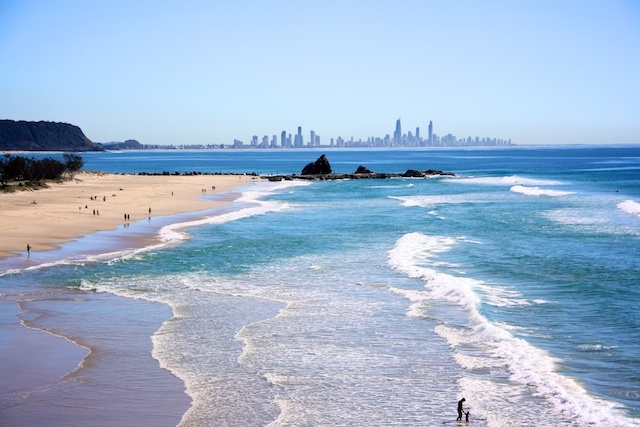 Currumbin Beach on the Gold Coast looking south towards Tweed Heads. 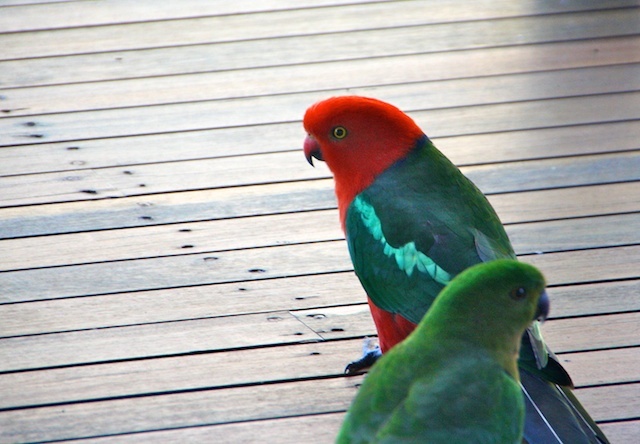 The Australian King Parrot is a beautiful bird. We don't usually see them around our home. I have seen them before in National Parks but not in the suburbs. 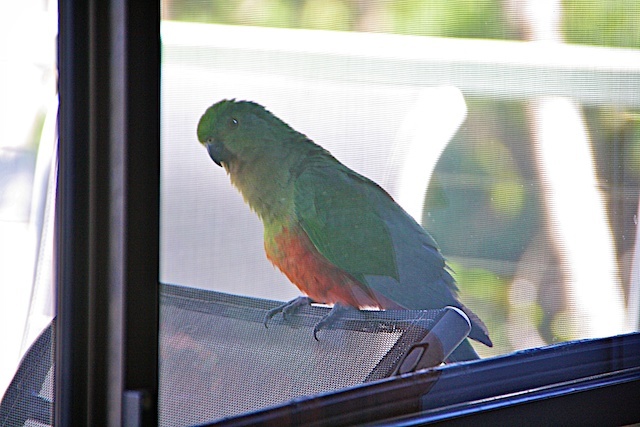 So it was a big surprise when six of them landed on our deck the other morning. 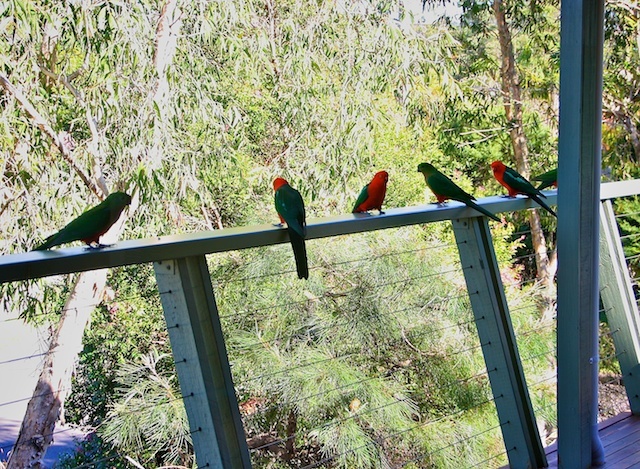 We don't have any feeders or feed any of the birds or local wildlife as our wildlife experts strongly advise that we don't feed our native animals. It is because they stop learning to forage for themselves and can suffer if the artificial source of food stops being available, like when we go on holidays or move house. There were 3 couples. They are very timid so I took all these shots through the glass windows trying not to scare them away. 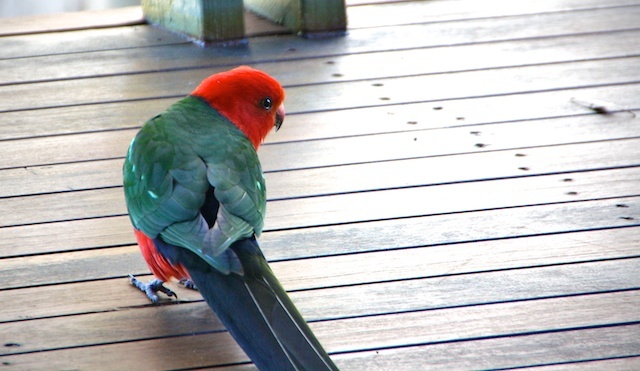 The King Parrot is a broad tailed parrot. 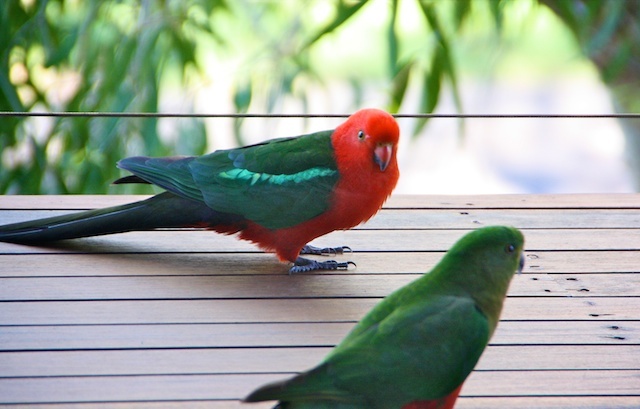 The male has a red head and chest. 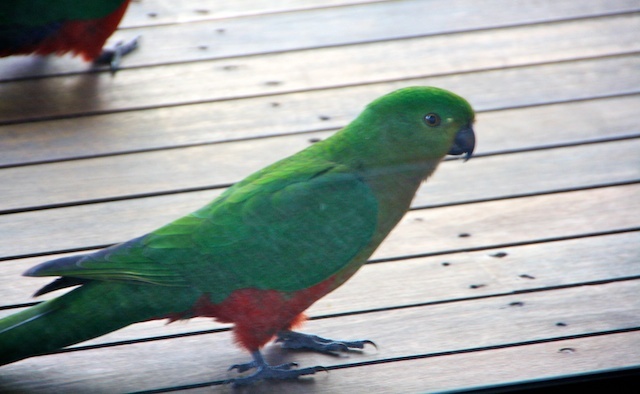 The female is mostly green with red underpants underparts. Today's prompt for Sepia Saturday meme is a photo of 3 people who could be siblings. Well I have just that in my old photo collection of my family. My mother came from a family of 8 born between 1896 and 1916. They were the Greenall family from north England. The eldest was a boy, Harry. The second eldest was a girl, Ada. The two youngest were my mum, Florrie and her younger brother Gilbert. 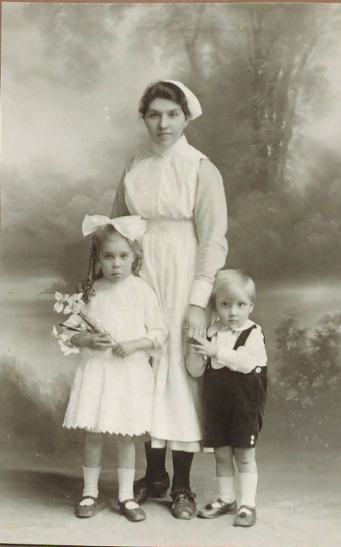 This photo is of the eldest girl Ada who had become a nurse and often helped her mother look after the little ones, especially Florrie and Gilbert. Unfortunately there is no date on the photo but guessing the age of the sibblings puts it around 1918 or 1919. All the Greenall boys except the youngest, Gilbert, migrated to the USA. Gilbert stayed in England, my mum migrated to Australia and Ada mostly lived in England, Canada and her later years in Australia with my parents. In the late 1980's my uncle Gilbert came to Australia to visit his sisters, for the first time. My mum, Florrie (on the left) and Aunt Ada (on the right). So these two photos of the siblings were taken about 70 years apart. They had lived a long way from each other for most of that time. 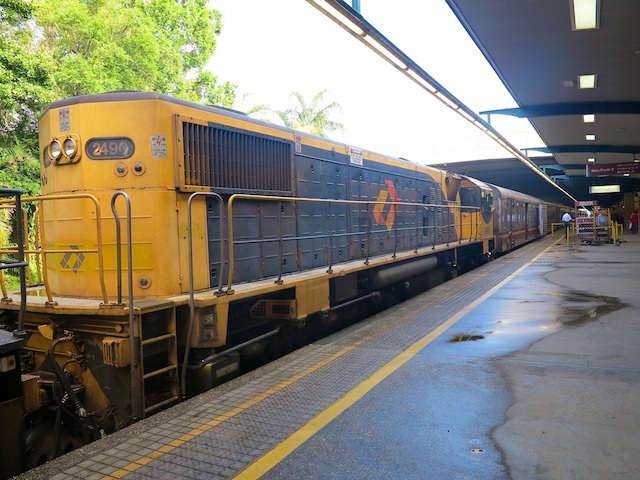 The Sunlander is the name of the train that runs the 1000km between Brisbane and Cairns in Queensland. 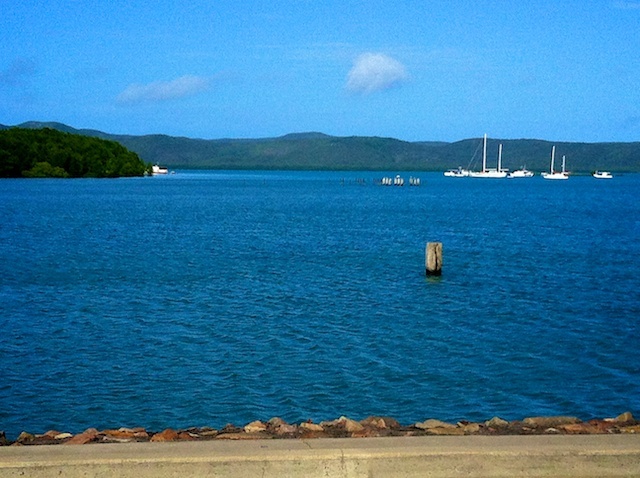 A few months ago we flew to Cairns and then went by road to the tip if the state. Then we flew back to Cairns and caught the Sunlander home to Brisbane. It took two days. 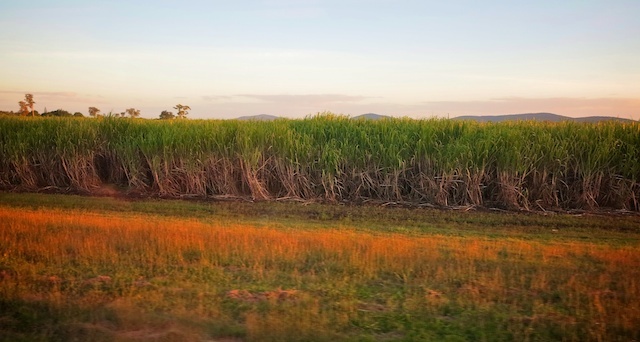 Our trip made us realise how big this state is and how isolated it is in Far North Queensland. 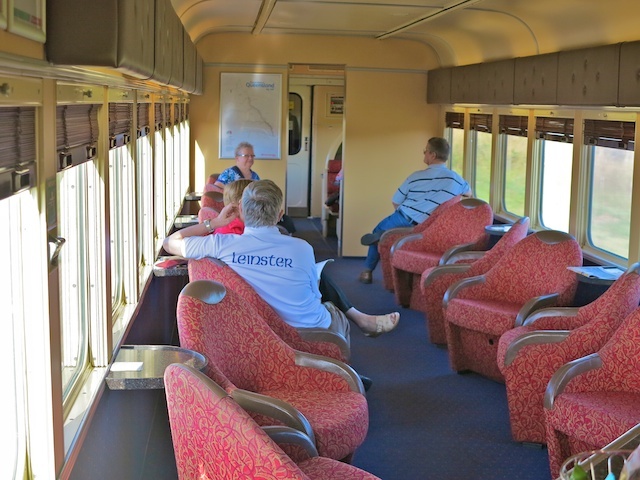 Aussie trains are not the most modern trains we've travelled on but it was a fun experience, especially as we were with fun loving friends, Ann and George. 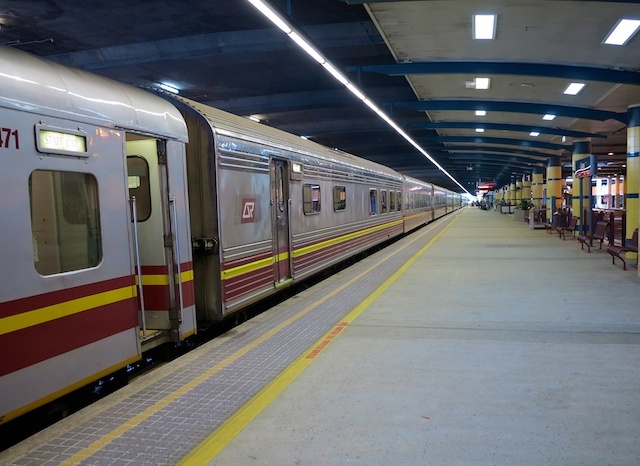 However, the trip from Cairns to Brisbane is ranked as one of the best 25 rail journeys in the world. The diesel engine pulling the train is quite ugly in comparison to the romantic steam engines but they are much cleaner. It was a wet morning and we were happy to be going home after such an adventure. 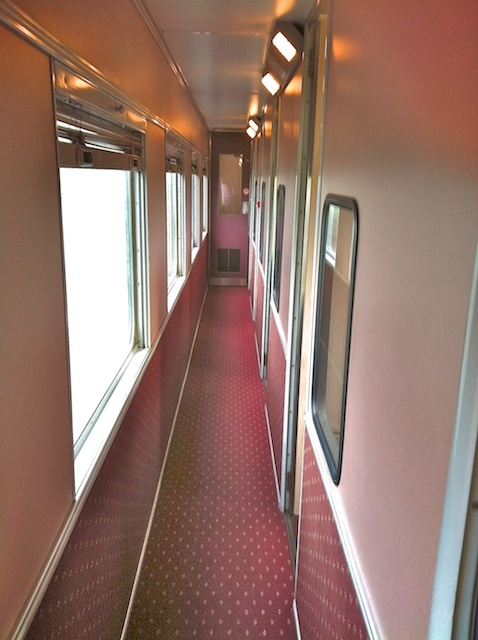 The long shiny train pulled in and our luggage loaded. We could only take a small carry on bag into our sleeper cabin. They were too small for suit cases. writing up your journal or playing games. I'm doing both!! 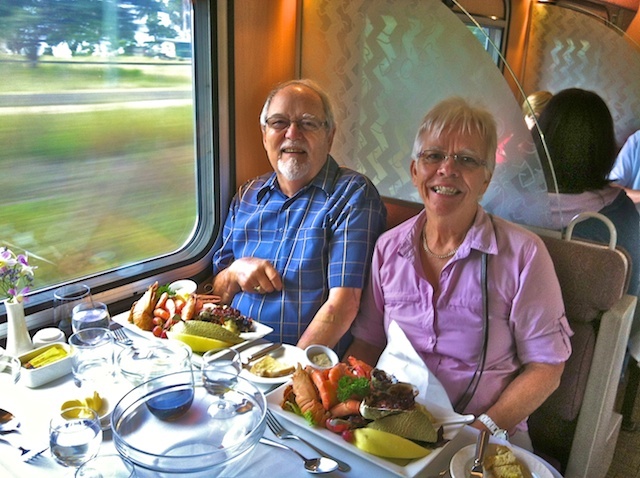 After the lounge car was the dining car and what a feast we had there. Our first meal was a seafood platter, fresh from the coast that we were travelling along. All the meals were delicious. 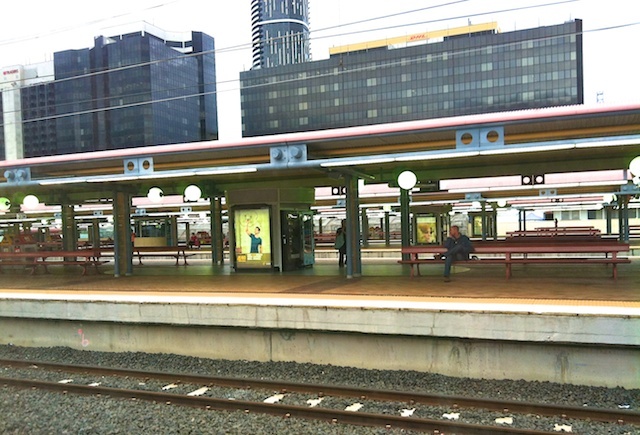 The train stopped at a few stations on the way picking up and dropping off passengers. We had made phone contact with Birthday Bear friends, Chris and Bob, who are travelling around Australia. 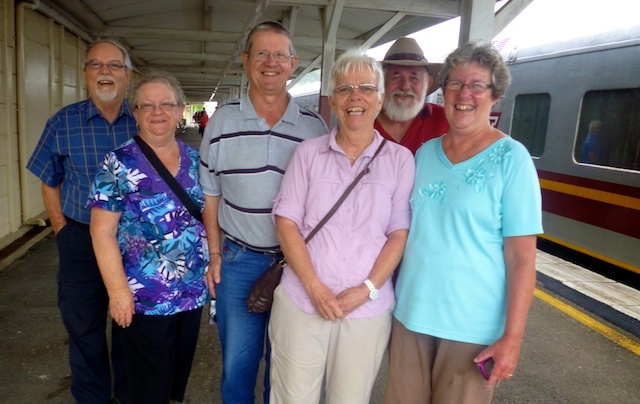 They met us at Tully, one of the stops and we had excited hugs and chats for the short time the train was in the station. They had their van with them as they were on the way to their next stop. Then it was back on the train riding through acres of sugar cane, eating another scrumptious meal and playing games before bed. When you return to your cabin the beds have been made up. 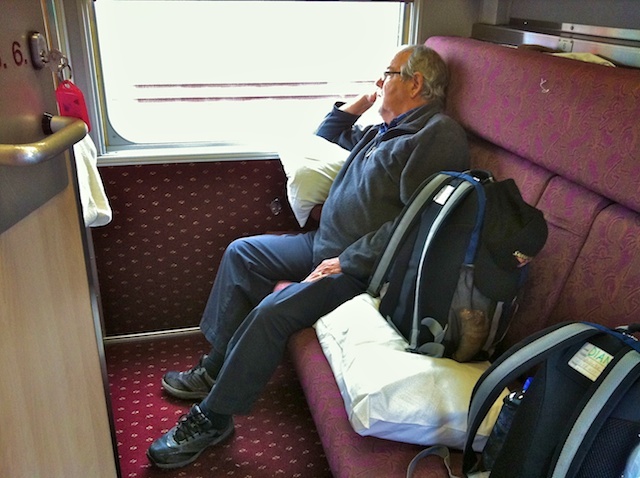 The seat converts to a bed and a bunk folds out of the wall. 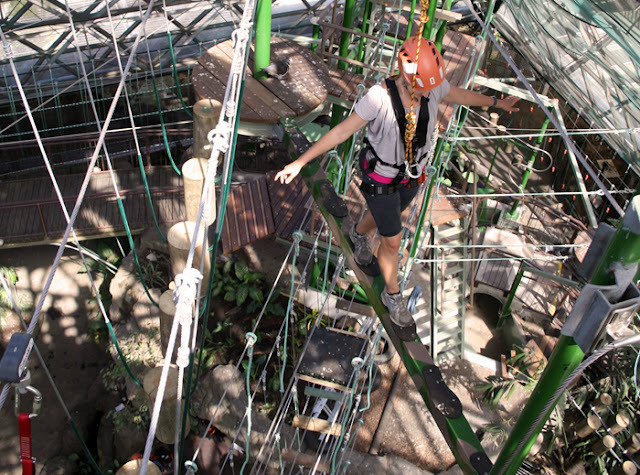 TOH had fun trying to climb up the narrow ladder and over the safety chain to stop him falling out. He even had more difficulty getting out in the morning. He was swearing and I was giggling. 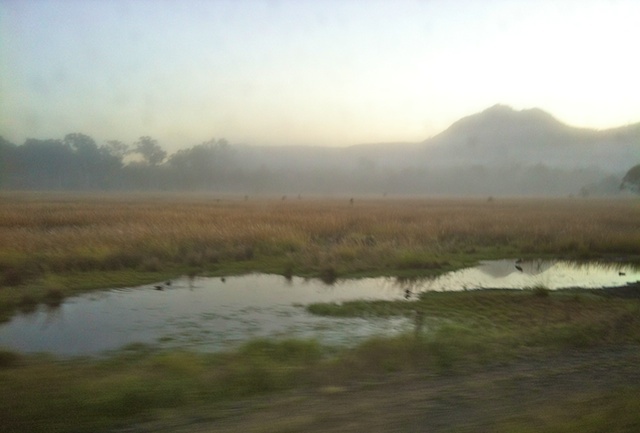 The scene out of the window in the morning was misty and romantic. After breakfast we found ourselves passing Gladstone and its huge aluminium smelting works. 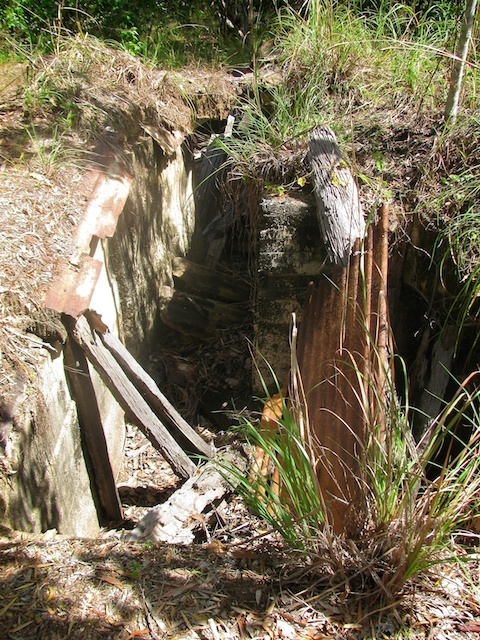 It is where the bauxite comes that we saw being mined in Weipa way up north. After a morning of lounging around, reading and chatting it was lunch, yes more yummy food. 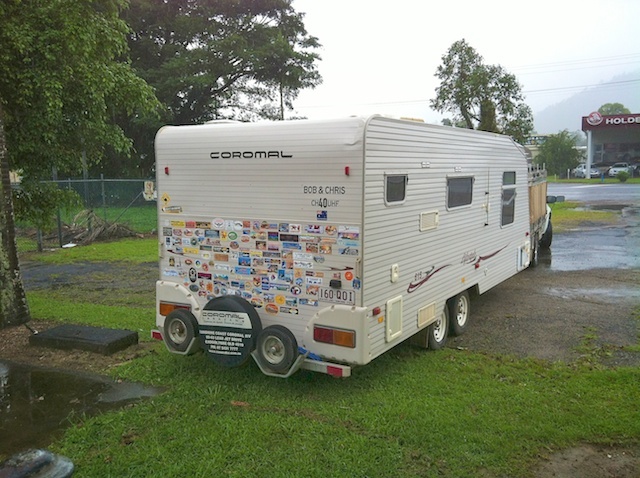 Later we returned to our cabin, packed up and looked forward to the welcome sites of Brisbane. At last we had arrived. Ann's daughter picked us up. The weather wasn't the best but our own bed was a welcome. 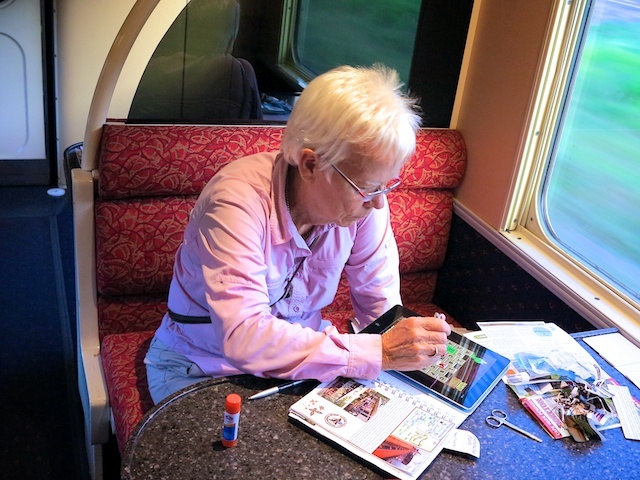 So ended another great adventure before dementia. 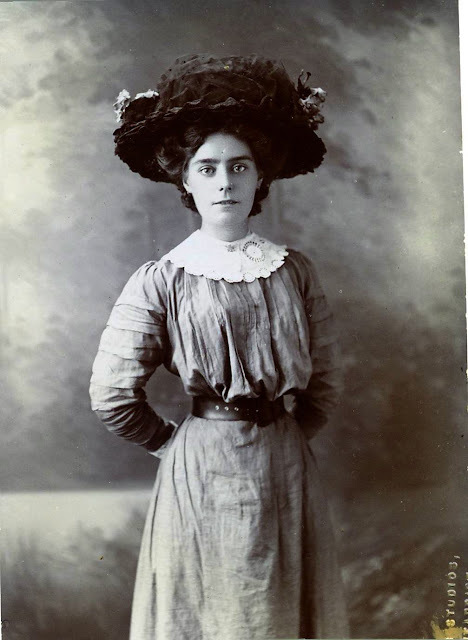 This beautiful young lady with the fashionable hat is my paternal grandmother. I never knew her very well. 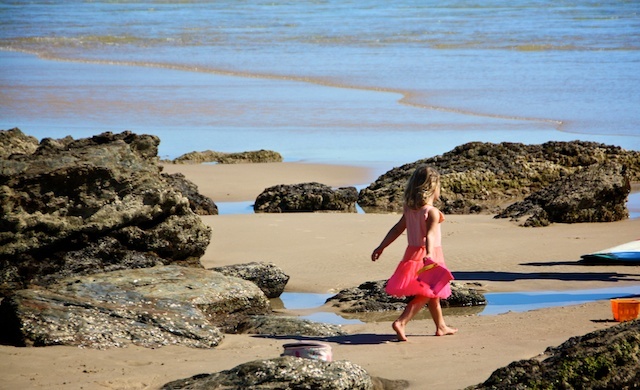 I was 6 when we left England to migrate to Australia in 1949 and left all my grandparents behind. When I returned to England for the first time in 1970 this grandmother was the only surviving grandparent that I had. Unfortunately, she had dementia and wasn't sure who I was. I tried to explain that I was her son Len's daughter but she seemed to think I was his wife. My dad was an only child and my brother and I were their only grandchildren. Now that my grandchildren live overseas, I know how sad it must have been for my grandparents. However, I am lucky in that I can manage to visit mine once a year. My grandparents never saw us again after 1949 when we were 6 and 11. We could never afford to return to England as a family, but my parents went in 1965 they tried to get my granny to come to Australia but she wouldn't move from her home. My grandfather and maternal grandparents were no longer living. I think she looks a beautiful young lady and I wished that I had known her then. My dad often remarked that his mum was very reticent about discussing her family. He always felt there was some sort of secret involved. I wonder what it was? My mum used to show me this photo and say, "This is your granny when she was young and her waist was only 18 inches." I love her hat and dress. I think the photo was taken about 1912. This post is linked to Sepia Saturday where the prompt photo was of a group of young women having a picnic. They are wearing fashionable hats. 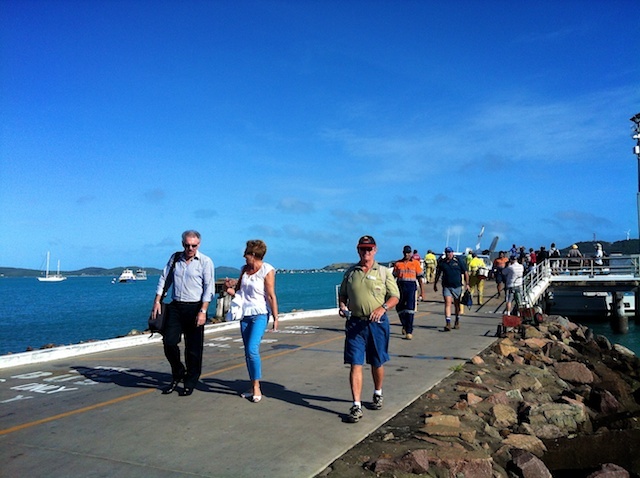 Our wonderful tour of Cape York was over. We flew back from Horn Island to Cairns, where we had two nights before catching the train home to Brisbane 1700k/1000m away. 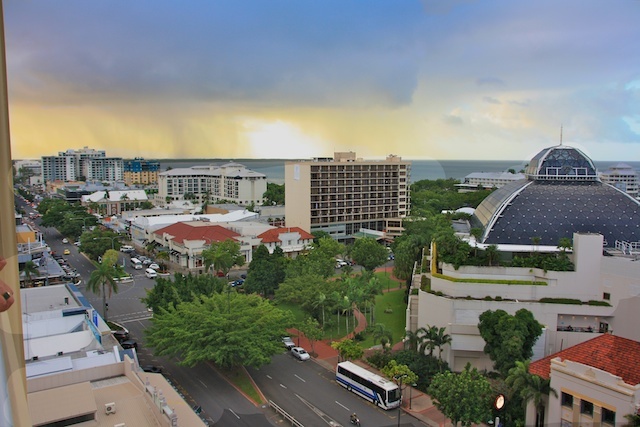 Cairns is the biggest city in Far North Queensland. 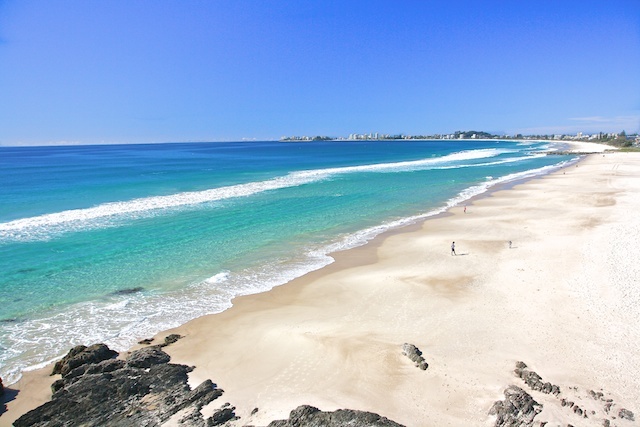 It has a cosmopolitan population of 150,000. 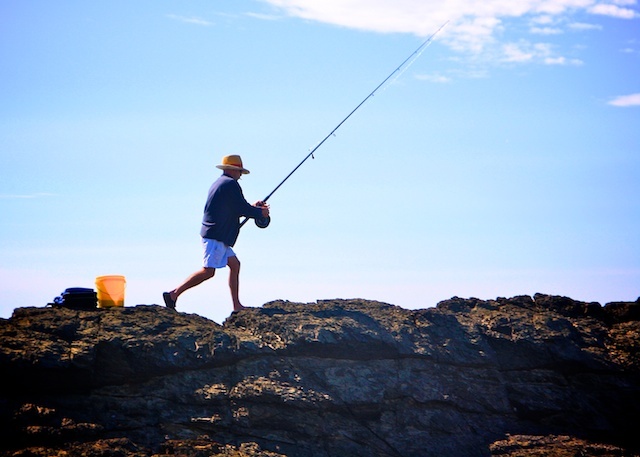 It is a very popular tourist town as it is near the Great Barrier Reef, heritage tropical rainforest and the Atherton Tablelands. They have the best seafood restaurants too. 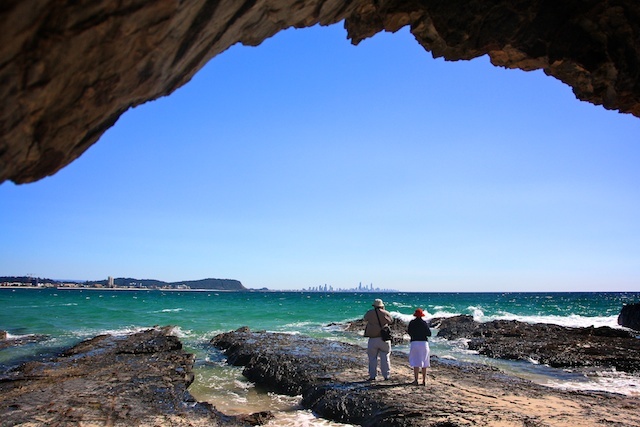 There are heaps of attractions, activities and site seeing for tourists. 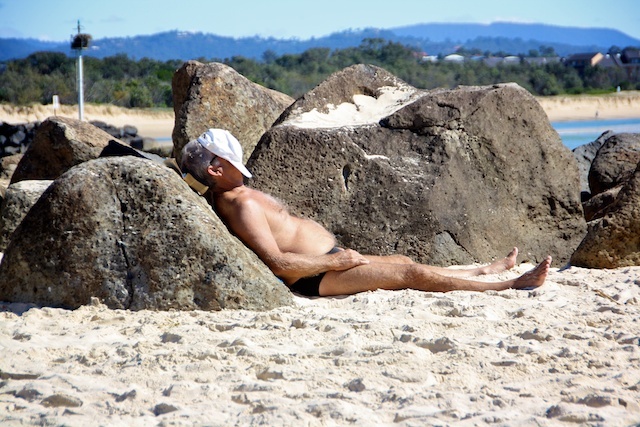 The best time to go to Cairns is in the cooler dry season between May and November, the other months are too wet and hot. 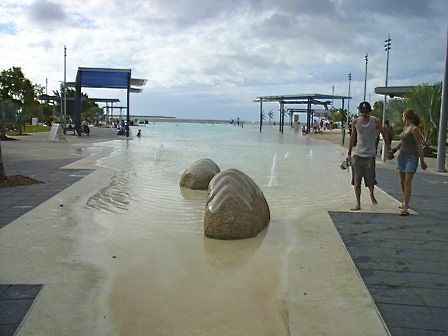 On our free day in Cairns we set off for a walk along the esplanade to the man made lagoon for safe swimming. However, the weather was showery and windy so we turned back. 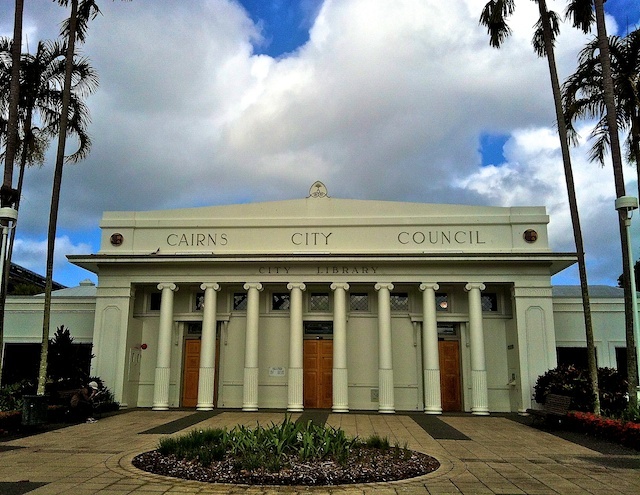 We passed the council chambers and headed towards the Casino Dome. The Casino was opposite our hotel. You can see the dome. Inside the dome is a zoo, rope courses and a zipline over the animals. As it was raining we thought this would be a good place to visit. My camera was getting worse at getting the exposure right so I used my phone. 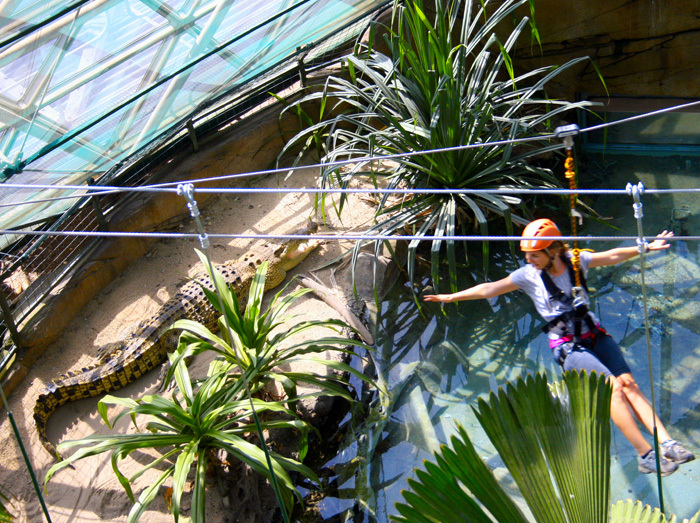 The main attraction was Goliath a huge 4 metre salt water crocodile. Part of the dome had to lifted off to get Goliath inside. He had to be lifted into the Dome by two cranes it took 1.5 hours. He has his own pool. 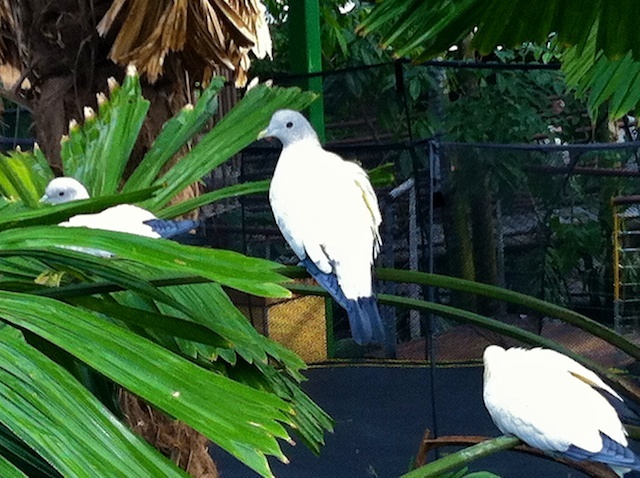 There are many different birds all free flying around the 300 tropical plants. 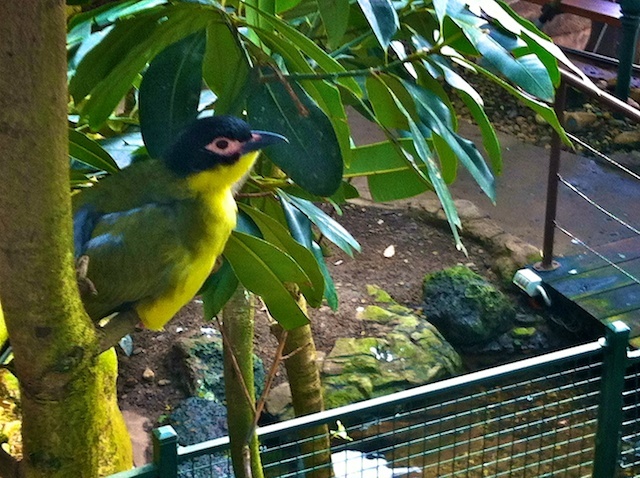 Sorry that I can't remember the names of the birds. Bird bloggers Carol or Eileen might help out here. 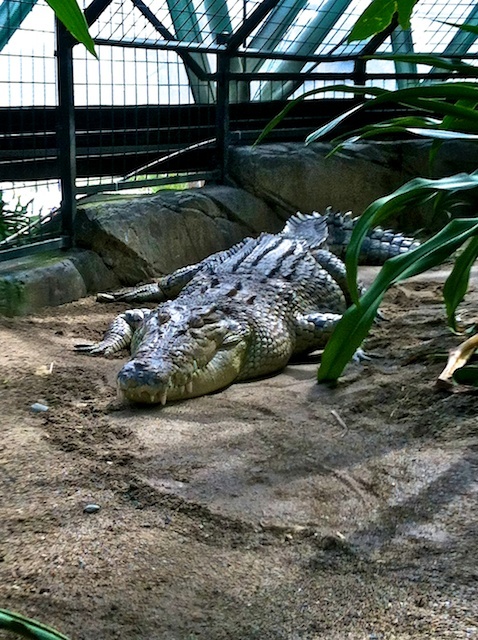 There were many other Australian reptiles, birds and mammals there too. 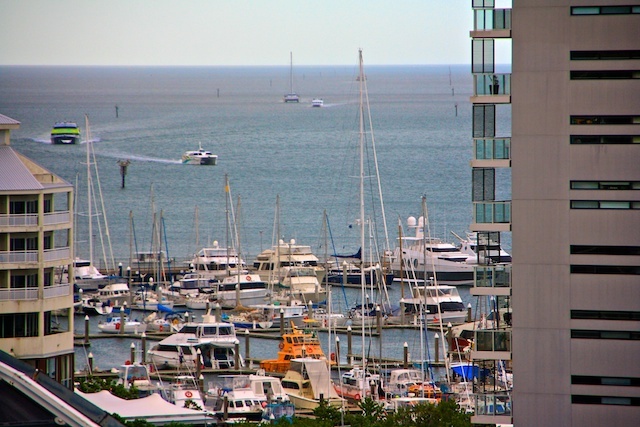 We returned to our hotel for a rest and to say goodbye to Far North Queensland and we were looking forward to our 2 day train trip home..
We watched the boats returning to the harbour loaded with excited tourists who had spent the day snorkelling, diving and sightseeing on the reef. 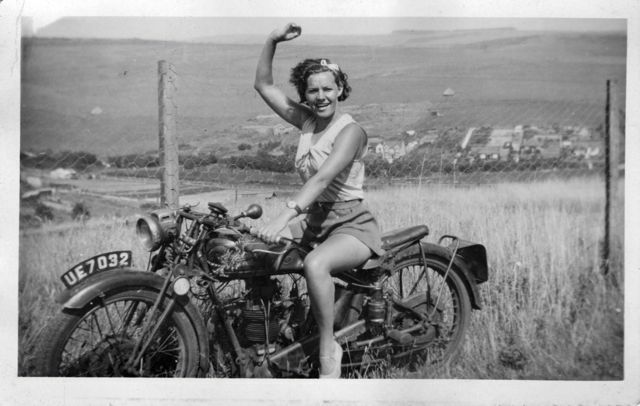 Going through my mum's old photos I found some which are suitable for this weeks Sepia Saturday theme. The above photo is the prompt for the theme. The photo is titled "What An Amazing Contraption". It provides us with an opportunity to search out photographs featuring all manner of strange or unidentified contraptions. And if you are fresh out of contraptions there is always cars or people sat in ridiculous positions. 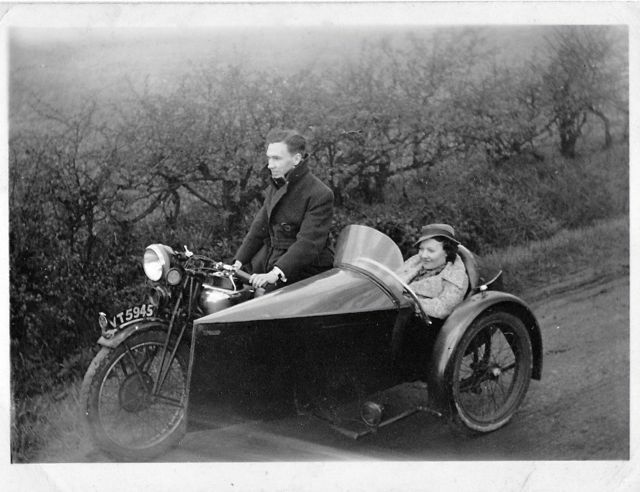 My mum and her cousin off on a jaunt in a contraption in the early 1930's. 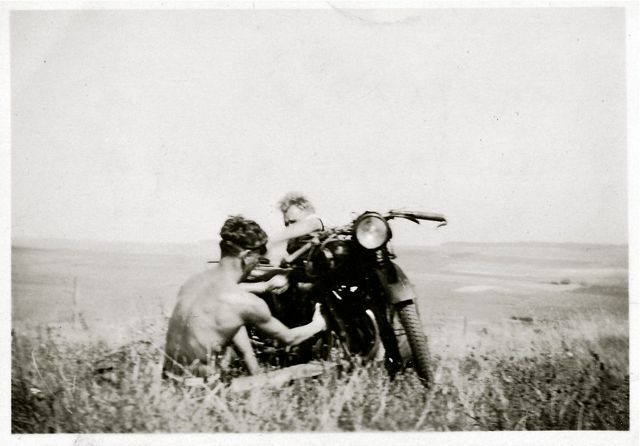 My dad tinkering with his motorbike with his father's help in the early 1930's. A generation later my brother is tinkering with a motorbike in the early 1950's. 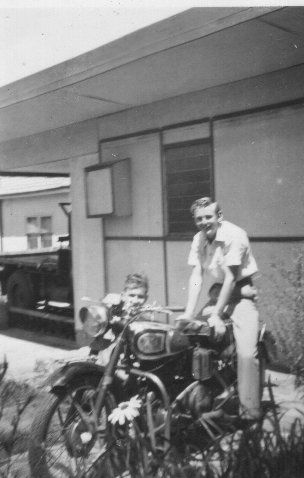 My brother, David, is behind the bike, his friend Mervyn is on the bike. 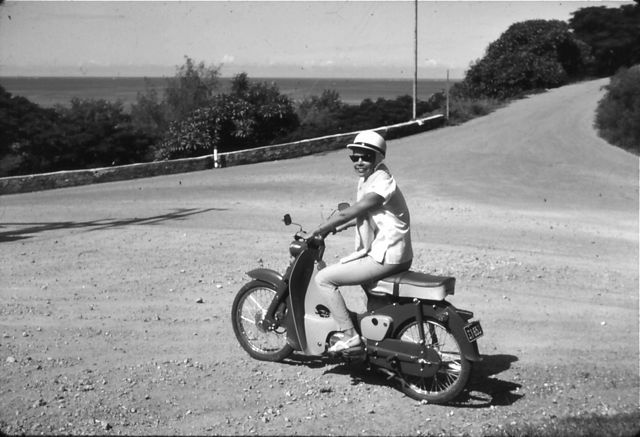 A generation later in the early 1960's, I owned a motor scooter, in Papua/ New Guinea. I was on my way to the beach with a towel around my neck. 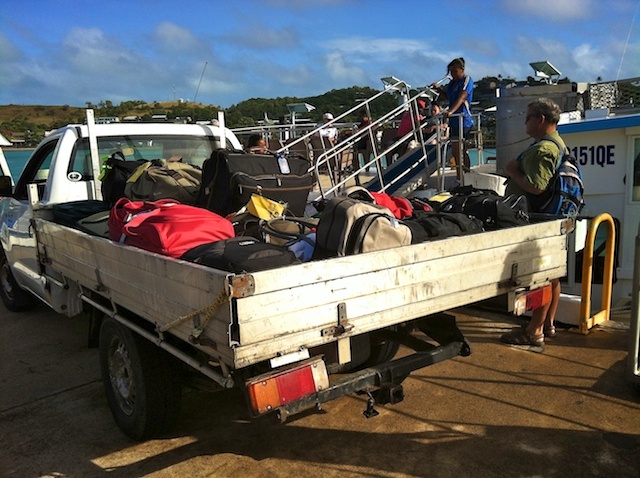 Our bags were transported from the hotel on Thursday Island to the small ferry which would take us to Horn Island and the airport. We walked from the hotel as it wasn't far. I was interested to see the children arriving for High School by ferry and all sized boats. It didn't take long to get to Horn Island which is bigger than Thursday Is and that is why the airport is there. 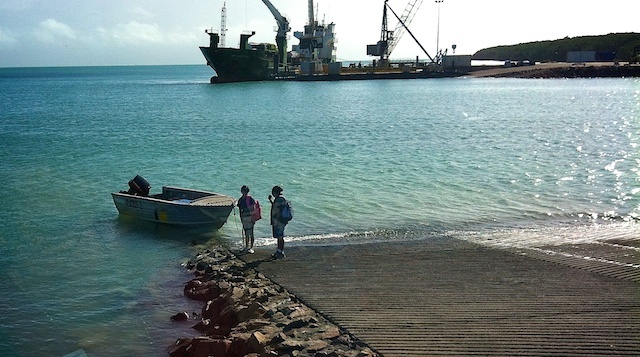 The Torres Strait Island People spend a lot of time on boats either fishing or travelling. Children on their way to school by boat. They are waiting for Dad to take them. We were met at the wharf by Vanessa the tour rep who drove us to the airport and went to check us in. Some minutes passed when Vanessa returned from the counter and told us that we have all been offloaded as the size of the plane had been changed and it was too small for everyone. The next plane was due at 3:30pm it was 9:00 am when we were told the news. Luckily the tour rep was a lady with many hats. She was part owner of the Gateway Resort, she was the founder and curator of the war museum, an author and a local tour guide. She organised for the airline to pay her for catering for us all day, she had obviously done this before. She took us to her resort and gave us lunch. Then she took us on a historical tour of the island. Gun emplacements being swallowed by the bush. It turns out that Vanessa has written books and been in documentaries about the research she has done into the war years on Horn Island. 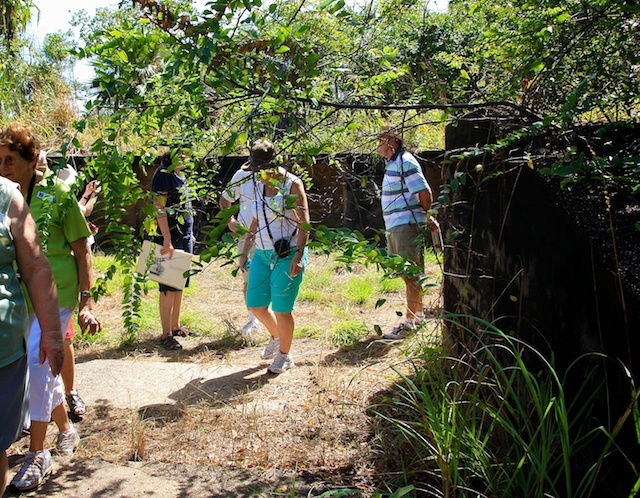 Not many people are aware of the plight of the Island during the war, including us. 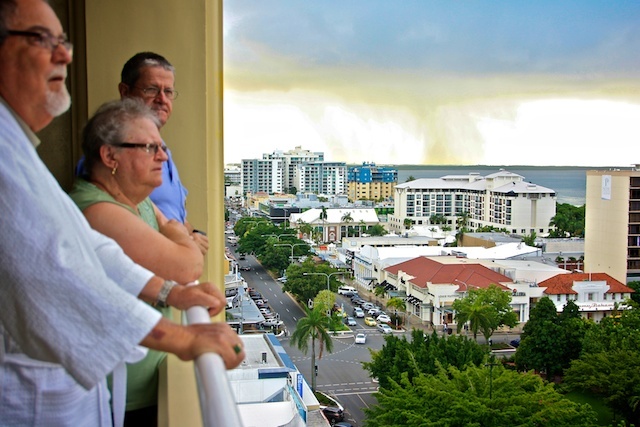 After Darwin, Horn Is was the most bombed part of Australia. The Japanese had control of New Guinea and Horn Island airstrip was in a good position for a base from where they could attack the east coast of Australia. The few men that were there did not have anti aircraft firepower they only had zig zag slit trenches to take shelter against bombing and strafing. Luckily for them an American unit on their way to Darwin were able to chase off the 12 zeros and 8 bombers. However, The Japanese returned on six more bombing raids but by this time ground troops including Torres Strait Islanders, Australians and Americans had increased to 5000. They flew on bombing raids to New Guinea. Many planes crashed on their return. The airstrip was too short for the big bombers. 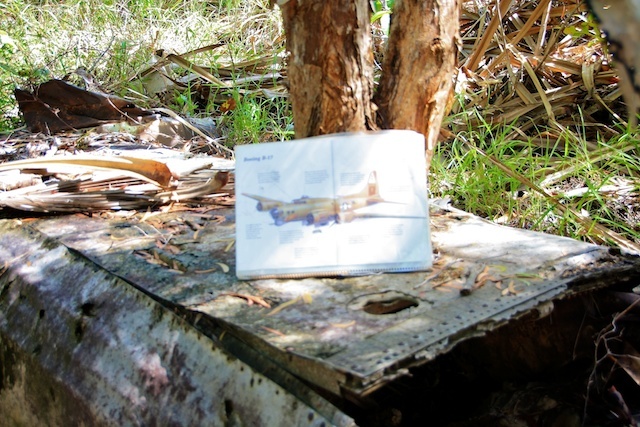 The wreckage of planes is still lying where they fell. The men not only had to fight the enemy but tropical illnesses as well. These men were never recognised for the effort and successes that they had. Vanessa and her husband and his family have made it their mission to rectify this state of affairs. Vanessa has made submissions to the Govt. She also organised a reunion of the American unit that was based here. The veterans were flown from USA back to Horn Island. 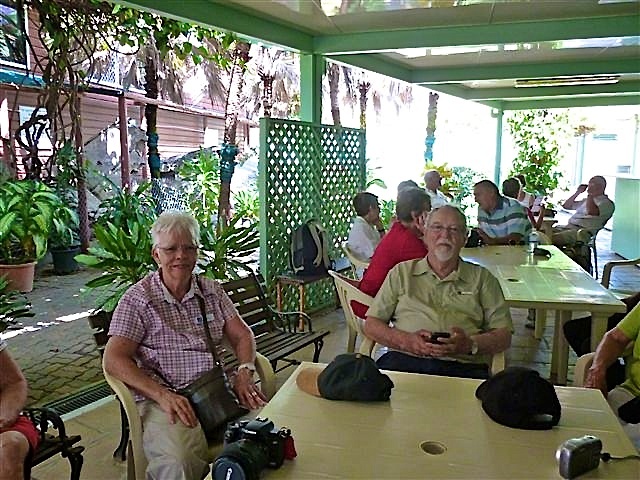 After the tour we returned to Vanessa's place, explored her museum and watched the documentary on the reunion she organised for the service men who were stationed here. Then we waited for her to take us back to the airport. So we had an extra day's tour than we expected. 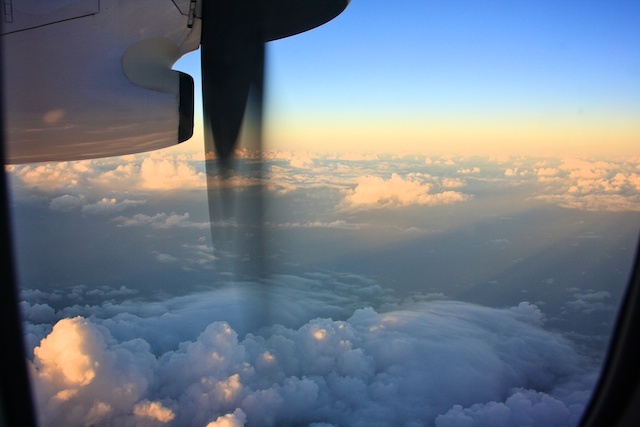 We were happy to be winging our way back to Cairns. 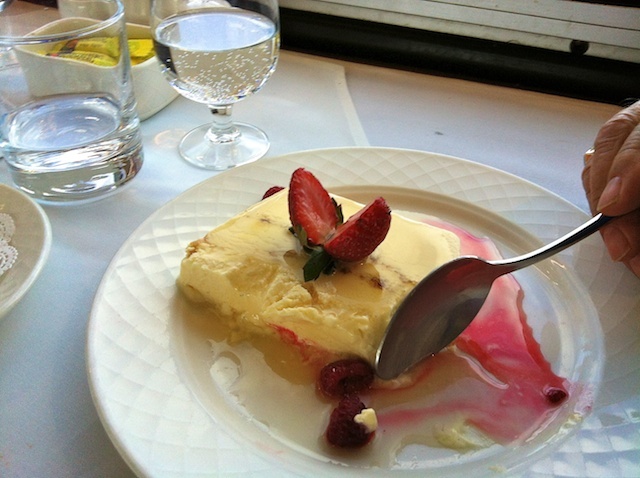 That night we had a delicious meal at the Hotel in Cairns. 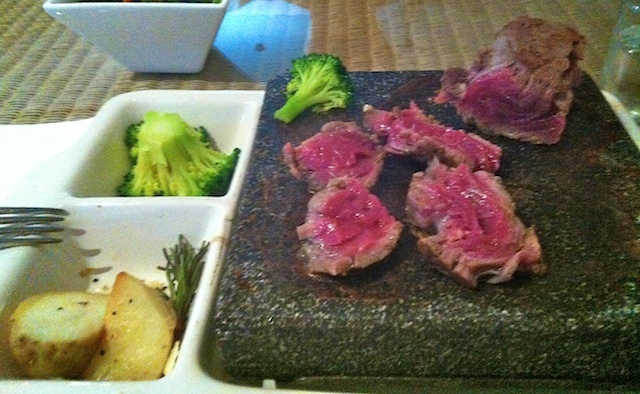 Lovely tender steak cooked by yourself on a volcanic hot rock.